Comet Hale-Bopp has generated more controversy than almost any other astronomical event in the past few decades. But for the moment lets leave the rumors about Hale-Bopp companions, mysterious radio signals and connections with extra terrestrials behind for a moment and take a look at what we do know about Hale-Bopp and comets in general. Even though comets bright enough to be seen with the naked eye are relatively rare, comets themselves are actually pretty common. Every year astronomers spot about twenty or more comets. Most of these never make the news reports in the popular press because they never become visible to the naked eye. Comets often can never be seen with the naked eye, even at their brightest. Only rarely does a comet become bright enough to become truly spectacular. In the past couple of hundred years, only a handful of the hundreds of comets that have zipped past the Earth on their journey around the Sun have become bright enough to have been really noticeable. What makes a comet such a spectacular sight is not how large it is, but what it is made of. Comets actually are fairly small things when compared to planets and stars. They generally range in size from just a few miles across up to around 100 miles across. That makes them pretty insignificant when compared to other objects in the Solar System. Its their composition that makes them different. You may have heard them referred to as dirty snowballs, and thats fairly accurate. Comets are made up of frozen gases and water ice, often with a core of rock. As a comet approaches the sun, it warms, and the frozen gases begin to thaw. It begins to emit dust and gas as it warms. At first this vapor and gas remains close to the nucleus of the comet, making it appear as a fuzzy looking object in the sky. But as it comes closer to the sun and warms even more, more and more gas and dust are thrown off by the comet, making it look larger and brighter than it really is. The visible head of the comet is really a cloud of water vapor, dust and gas surrounding the nucleus of the comet. As it approaches even more closely, it begins to form a tail, which can be millions of miles long. Comets actually have two tails. The most visible is the dust tail made up of tiny particles of dust, gas and water vapor. The other tail, the ion tail, can be even longer, but because it is composed largely of plasma, the ion tail is usually visible only in long exposure images taken through telescopes. Other, often quite spectacular events can occur as the comet approaches the Sun. Pockets of gas, exposed as outer layers of the comet erode away, can suddenly burst forth, causing spectacular looking jets of material streaming away from the comet. Large chunks of the comet can break away from the main mass, or the comet can even fragment completely as SL9 did in 1994 before it hit Jupiter. Eventually the comet will lose most or all of its volatile material after many passes past the sun. Once the gas and ice is gone, all that remains is a rocky core that looks a lot like an asteroid. Many of the near earth asteroids may be the remnants of comets. Other comets come to a more spectacular end, as Shoemaker-Levy did when it crashed into Jupiter. In fact, some scientists believe Jupiter acts as sort of a giant vacuum cleaner, sucking up stray asteroids and comets, and sweeping the inner solar system free from debris. If it werent for Jupiter and its giant gravity well, the inner solar system would be littered with debris that would come crashing into the Earth so frequently that it would have made life here nearly impossible. 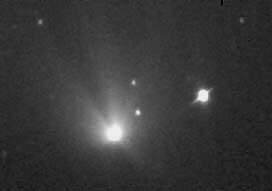 Although Hale-Bopp has attracted more interest because it is brighter than most, it appears to be a fairly ordinary comet. It was discovered by two people simultaneously on July 23, 1995; Thomas Bopp of Arizona and Alan Hale of New Mexico, hence the hyphenated name, Hale-Bopp. Hale-Bopps closest approach to the Earth will be on March 23, 1997. It will come within about 120 million miles of the Earth. In March and April it will be easily visible from the Northern Hemisphere if it becomes as bright as astronomers expect. The latest estimate of the comets actual size (the size of its solid nucleus, not the gas cloud surrounding it) puts it at around 25 miles in diameter, about four times larger than Halleys Comet. Its very difficult to estimate the size of a comets nucleus, however. Unless the nucleus can be directly imaged by a spacecraft from close range, as was the case with Halley, trying to accurately determine the size of the nucleus is extremely difficult. So far Hale-Bopp resembles every other bright comet that has visited our part of the Solar System in the past, and like every other bright comet, it has generated a considerable amount of rumor, speculation and odd stories. The most prominent story about the comet is the Shramek photo. In the middle of November, Chuck Shramek of Houston took a photo of the comet that shows a bright, Saturn-like object near the comet. Mr. Shramek claimed that this was a large object moving along with the comet. Soon others came forward making even more astonishing statements; that the object was actually an enormous space ship, that it was emitting radio signals, and that there was a government conspiracy to hide the fact that this ship was moving towards the Earth. Some have even claimed that the comet has changed course due to the influence of extra-terrestrial forces. Copies of the Shramek photo have cropped up all over the Internet, and every professional astronomer who has seen it has said the same thing, that the Saturn-like image is just a star surrounded by diffraction spikes or some defect in the telescopes optics. Im an amateur astronomer myself, and Im familiar with the way images can be distorted by flaws in optics and obstructions in the light paths of telescopes. I have to admit that it does look like a distorted star image. However, the only star in that position is a 9th magnitude star that should appear only as a pinpoint of light, while the object in this image is nearly as large as the comet. If the object is indeed caused by a defect in the telescope or difraction spikes, would that also have caused the object to appear this large? Other claims simply dont seem to make much sense. According to one, the government is involved in a massive attempt to prevent the public from gaining any information about the comet, and is suppressing all photos made of the comet, and that no new images of the comet have been published since May. The problem with the government suppressing information is that it would be impossible for it to suppress everything. There are literally tens of thousands of amateur astronomers out there, and many of them are equipped with telescopes, cameras and CCD imaging systems that rival low end professional equipment. Since Hale-Bopp is one of the brightest comets to come along in recent years, almost all of those amateurs have been pointing their equipment at the comet. There is simply no way the government could suppress information from all of these sources. And as for there having been no images of the comet published since May, that simply is not true. A brief search of the Internet turned up almost two hundred images of the comet that have been taken since August, with the most recent that Ive seen having been taken on December 6. One of the more recent claims Ive heard is that Hale-Bopp has changed course, and was being influenced by an external agency, usually some sort of extra-terrestrial force. Astronomers say this is not the case. They say that scientists have simply refined the orbital path of the comet as more accurate information about its position has been made available to them, and that some people have misinterpreted the changes in the projected orbits. The indications from all mainstream scientific sources is that Hale-Bopp is simply another comet. Is it more than that? Only time will tell. Meanwhile browse through the information we've provided here and see if you can make sense of this mystery.